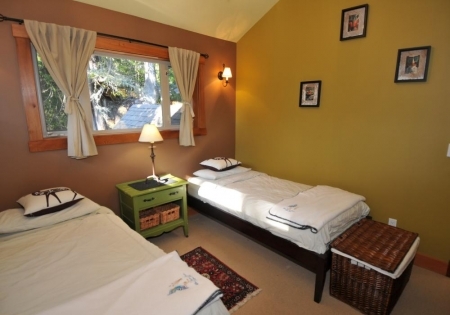 The Blue Heron guest house is luxurious accommodation situated in Tofino on Jensen's Bay just a short walk from Chesterman's Beach. Our beautiful custom built home features post and beam interior, shingled exterior, wood plank fir floors and a slate bathroom with a large soaker tub. Fully equipped gourmet kitchen features stainless steel appliances and cookware. The great room has a gas fireplace for those rainy west coast days, decorated with new comfortable furnishings. Jensen's Bay is located on the inlet side of the peninsula. It is an inter-tidal zone with the change of tides every 6 hours, ebbing and flowing into browning Passage. This is a wonderful property for those seeking a peaceful retreat or family get together. Ideal group size for this 3 bedroom house is 6 guests. We can accommodate 8 with the use of a sofa bed for an additional fee. A wonderful property for those seeking a peaceful retreat or family get- together. 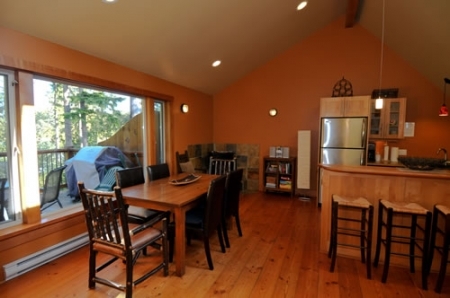 Our new custom built guesthouse features post and beam interior, shingled exterior, extensive wood plank fir floors, vaulted ceilings, skylights and a slate bathroom with soaker tub and heated floor. Fully equipped gourmet kitchen with stainless steel appliances and cookware and your very own champagne fridge. Their is a cozy gas fireplace for those rainy west coast days. The bedrooms feature 2 queen size beds, 2 twins and a leather sofa bed. Enjoy the comfort of quality bed and bath linens with down duvets and pillows, 2 BA , skylights, vaulted ceilings, private entrances and a great BBQ deck off of the great room. 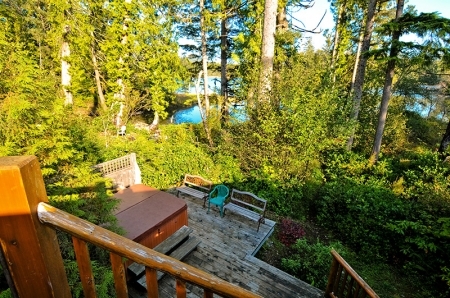 Outside entertain in the comfort of teak patio furniture and a hot tub nestled in the forest overlooking Jensen’s Bay. 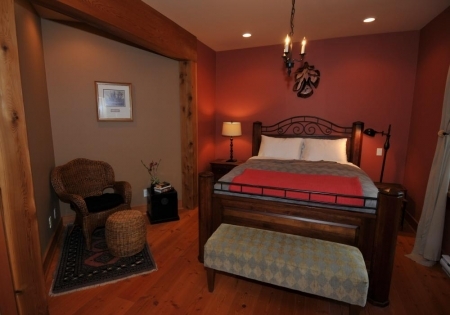 Ideal for families, honeymooners, or those just seeking a peaceful retreat. This unique property is maintained by owners.